all fit without having to cut them. We live in the northwest near Mt. 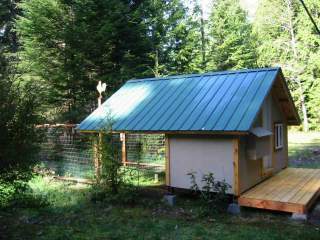 for a heat lamp and heated water bowl in the winter. latch, but hopefully it will do the trick. are tacked up against the post in the middle that holds up the bird net. the feeder so they sometimes roost on it. trimmed it with one by four which will be a barrier for sweeping it out. My friend had a good suggestion to replace it with sloped floor molding. are too small for them to use, maybe not? looking for good tractor examples. Can tractors be made dog proof? Let me know if you want me to send any other photos. "nice! wish there were more pics"
But needs more details and pictures. I dont lnow if it was my phone but could only see one photo. Would have enjoyed seeing the inside of the coop. The outside seem to have a decent size to it. And a good size run. Looks nice based on one picture, would have liked to see more.